Paying attention always pays off. It saves lives, it colors and flavors life, and is the best way to accrue new knowledge. How boring and drab isn’t it when we go with eyes closed through life? What better place to observe mankind than in coffee shops—they reward the intentional observer with endless material to ponder and write about. There is a science to coffee shops. It matters which coffee shop you frequent. It matters where you sit, which way you face, and what you order. This three-part series is the result of a clandestine subjective study conducted over the course of twenty-four months. 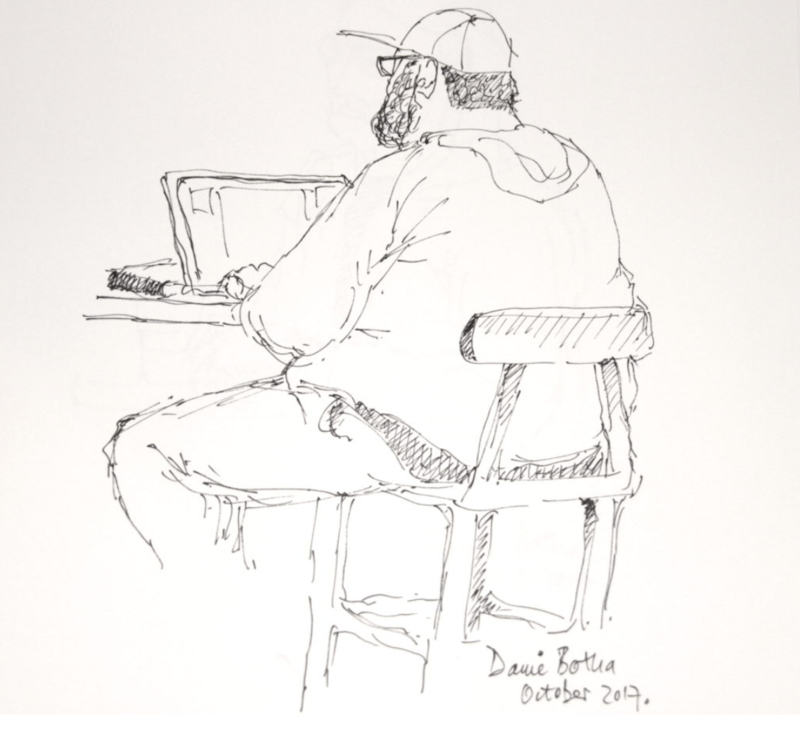 The Sitters are coffee shop patrons who, by definition, prefer to stay behind with their order and enjoy the ambiance of the facility. Sitters, like everybody else, has a bit of a history. Sitters, over time, become more “picky.” That’s where the science of coffee shops come in. It matters where you sit. A small percentage of Sitters are burnt-out Dashers. Sitters have principal objections to ever being found in the drive-thru lane. The essence of the entire coffee drinking experience is lost in the fast lane. Atmosphere cannot be rushed. They feel, if you order from the drive-thru lane, you can just as well order it online. The Student: They come complete with backpack, textbook, notebook, and laptop. Female students were observed to prefer passion tea lemonade versus male students who preferred coffee. (Location bias?) Close to 80% of students, irrespective of gender, also had a second order of iced water. Finding room for all of this on a small circular coffee table is quite a feat. Fifty percent of students, study solo; 25 % gather in pairs and 25% in even larger study groups. Students usually show up in the afternoons and evenings. It is not uncommon to see two students commandeering four tables. The Elite Student: Students showing up in designer attire, brand name purses, and the latest laptops. They all seem to pull out a tablet as well. Backpacks are verboten—an oversized second purse serves this purpose or a prim leather briefcase. The Fiction Writer: You’ll find them tapping away at the keyboard long before 7:00 am, quietly in their corner, with a quarter-gallon ceramic coffee cup. Dark. They prefer the same spot. Don’t mess with that! They only stay for three hours—until the noisy crowds show up. The Blogger/Nonfiction Writer: Similar to The Fiction Writers. In addition to a large coffee mug and laptop, they also have a stack of books for reference, besides them. They often wear headphones. The Readers: 5a: The Newspaper Reader: They stay for as long as it takes to read the front and sports pages and finish their coffee. 5b: The General Reader: The sit down with a coffee, something to nibble on, and a book. More often than not, General Readers seems to prefer paperback and hardcovers to eReaders. They usually stay for an hour, unless the coffee shop has upholstered leather armchairs. The Widower: He prefers the same high table and stool with a small coffee. He stays for half an hour, or for as long as it takes to complete the Sudoku. He seldom takes his sunglasses off inside and his mouth remains a thin line. One can’t help but wonder about his loss and hurt. The Breakfast Club: Usually two ladies meeting for breakfast at 8:30 am. If they end up at the table next to you, don’t freak out if your train of thought and writing starts stuttering. These are lovely people, but they’re loud—glaringly unaware of the oath of relative silence of coffee shops. The Socialites: Similar to the Breakfast Club, but this group of ladies, usually bring a third friend and show up an hour later, between 9: 30 and 10 am. They are super load. The only use outside voices. My advice is: it’s time to go home when they show up! The Lovers: They find it impossible not to touch some part of their beloved, whether standing in the line-up or placing lids on their drinks at the napkin counter or once they’re seated. No one else inside the coffee shop exists. They find immense strength from gazing deep, deep down into the soulful eyes of their partner. They’re not loud—they whisper sweet nothings into each other’s ears. The Nomad: A Sitter who can’t seem to find a satisfactory seat. They often move away from the window to a corner seat, only to, five minutes later, move to the other side of the same table, and then, ten minutes later, move to the other corner table. Does it really matter whether one is a Dasher, a Walker, a Sitter or a Drive-Thruer? Perhaps not. Then again, if there’s a difference between iced coffee, passion tea, hot espressos, and home-made decaf, then it matters. Coffee shops need us as we need them. By paying a little more attention to your fellow coffee drinkers, and eavesdropping ever discreetly, you will, more often than not, stumble upon a goldmine of material to ponder about or perhaps use. If you practice and become a willing observer, you may just be allowed a peek into the soul of a town or city, if not the nation. Aren’t we all wonderfully weird individuals? PS 1 No patrons were inconvenienced during the entire study period. The author did his utmost to remain inconspicuous while observing mankind. PS 2 The author also wishes to express his heartfelt gratitude toward baristas in all the coffee shops who patiently put up with patrons’ quirks and shenanigans, always ready to serve with a smile. Hats off to you! And a toast of good health to you all! A somewhat longer version of this article also appeared on Medium.com. All images by Danie Botha.